School Photos. You either love them or hate them. They happen at least once a year, some schools do it twice. You feel obligated to buy them and just hope that your child smiles and doesn't look like a hot mess. This year Ella's school gave the option to order online with more background selections, different poses to choose from, and a million packages available. (I maybe exaggerating a little but you get the point.) We opted on a smaller package with a half body pose and a few wallets to give to her grandparents. Ella and I went shopping picked out a really cute dress which would be perfect for a fall day. Welcome to Ohio and picture day decided to be 90 degrees outside, in a school with no air conditioning. I was not sending Ella to school in a long sleeve dress with cutout shoulders. We had to change her outfit choice and she decided on this cute dress my mom (or was it my sister) got her last year. I let Ella pick out her background. I love the way her photo turned out. Now I just have to remember to give everyone their photos. 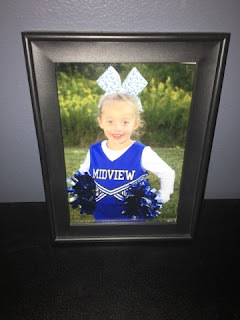 Ella also got Cheerleading photos this year. Her step mom helped pose the photos and made the kids look great. I love the way Ella's turned out. It really shows her sassy personality. Both photos I have are in 5x7 photos frames sitting on shelves in our living room. None of our frames match. I have these frames from Amazon sitting in my cart ready to order, I just haven't pressed purchase yet. 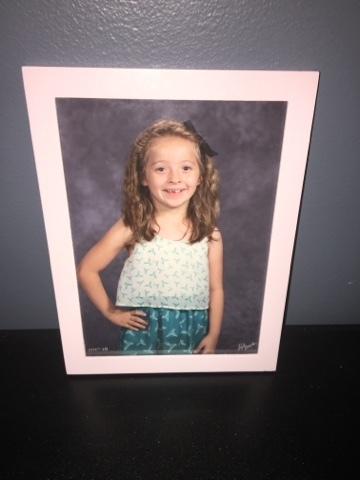 Do you purchase your kids school pictures?